The most fun rides have no destination in mind. A good ride is one where you see lots of neat sights, meet some cool people, ride a really twisty piece of pavement, break — for a second — the posted speed limit, and arrive back where you started safely. Great rides last longer. WE ARE BLESSED in this river-bordered tri-state area to have an abundance of well maintained, curvy, paved roads to explore — with the added bonuses of green pastures, black and white cows, and skyrocketing limestone bluffs, not to mention a supper club or roadside pub every few miles to quench a dry wind thirst or wash down the june bug that lodged in your throat two miles back. ON APRIL 17, a group of friends and I decided to ride up to Buck’s Bar in Minneiska, MN, one of the last stops on the Flood Run that starts in the twin cities and follows the Mississippi down the Wisconsin side on Highway 35 to Maiden Rock and Nelson, WI — where the towns play host to thousands of thirsty and hungry riders. 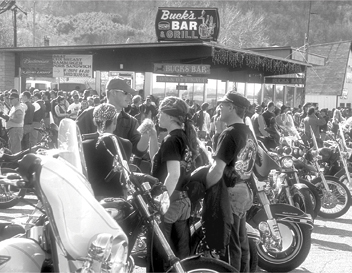 From there, many continue across the bridge to Wabasha, and down the Minnesota side on Highway 61 to Buck’s Bar in Minneiska, MN — where they meet up with even more riders to enjoy a refreshing beverage and another brat. I may make my living by taking pictures, but I’m not stupid or hard of hearing; and I believe with every not-broken bone in my body that he meant what he said. Then the gentleman who was sitting looked up at me and very politely said, “Please don’t take my picture.” Actually, I’m not sure he said “please” because about then I noticed the words Hell’s Angels written like a billboard across the man’s black leather vest — and my heart, my body, and my thought-waves weren’t really working like a well-oiled machine. “No problem — none at all,” I think I said. 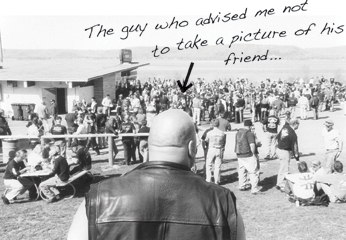 The bigger guy turned back around and I shot my pictures — and then returned to hide amongst the crowd, thinking I was being constantly watched. THERE WILL be a fall Flood Run Sept.18. Next year’s spring ride is April 24, or the Saturday after Easter. For more information stop at Bucks Bar in Minneiska or any drinking establishment in Nelson, WI. If you plan to come up from the south and join the group at the end at Buck’s, here’s how to get there from Brenda’s Bar in downtown Waukon, IA: Take Highway 76 north past Dorchester, IA (a gorgeous ride through the Upper Iowa River Valley), past Eitzen MN to Caledonia. At Caledonia, 76 turns down the wooded Root River valley and into a rider’s dream of sharp corners and steep descents until it spits you out in Houston, MN. Highway 76 continues on a few miles until it ends at Interstate 90. You cross under the interstate hit county road 12 to Witoka then through yet another valley dotted with horse farms, large homes, and scenic pastures, making your way into Winona, MN. From there it’s just a short 15 miles up Highway 61 along the big river to Minneiska and Buck’s Bar where you can relax with a cool beverage and stare lazily out the many river-facing windows at the motorcycle parked next to yours — the one that’s got a much cooler paint job. This essay first appeared in The Tapestry magazine (Vol. III, No. 5. May, 2004). 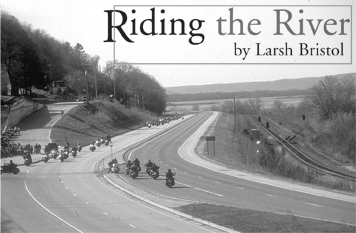 Our thanks to Julie Berg-Raymond for sharing Larsh’s articles (and therefore his humor and personality) from Tapestry to be included and enjoyed by visitors to Larsh’s web site.